Now you can buy 5 Random Skins cd keys for CSGO at the best price. 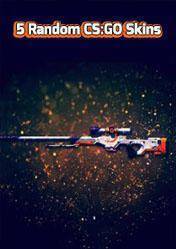 This product is 5 cd keys or serials that give you access to random skins for all types of objects: knives, guns, stickers and much more for Counter Strike Global Offensive, or GSO. Each listed store has different methods to enable access to these 5 Random Skins, so we recommend that you carefully read each of the ways to access the skins, although all of them have been tested and work perfectly . Do not forget to activate these codes weapon skins need to have the original game Counter Strike Global Offensive in your Steam account. CS:GO HOW TO GET FREE SKINS 2019! NO DEPOSIT! HOW TO GET FREE CS:GO SKINS 2019! No deposit!